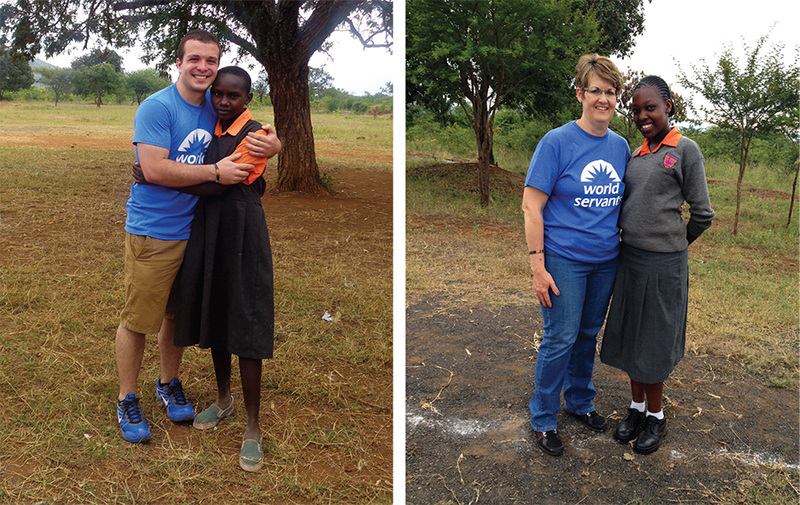 POET team members travel to Kenya as part of Mission Greenhouse to continue the work on the school dormitory. 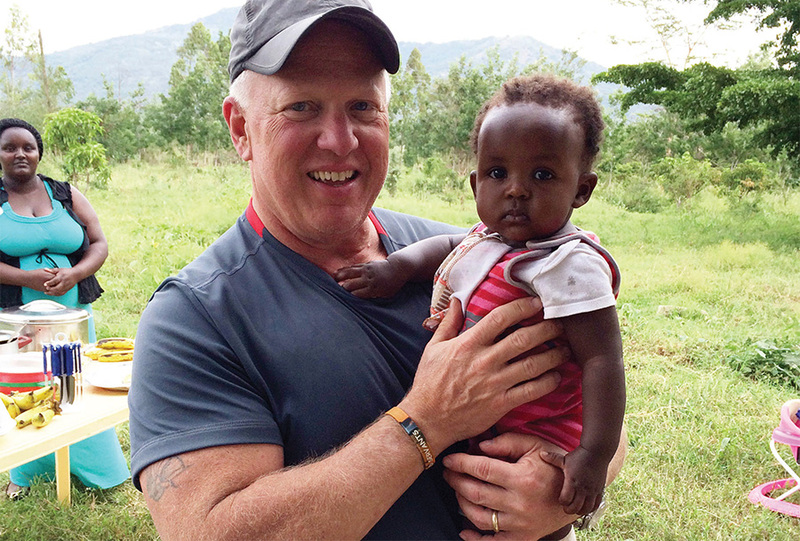 In its third year, Mission Greenhouse returned to Sultan Hamud, Kenya in early June. Fifteen POET team and family members put the finishing touches on a new dormitory which was started by the Mission Greenhouse team the year prior. 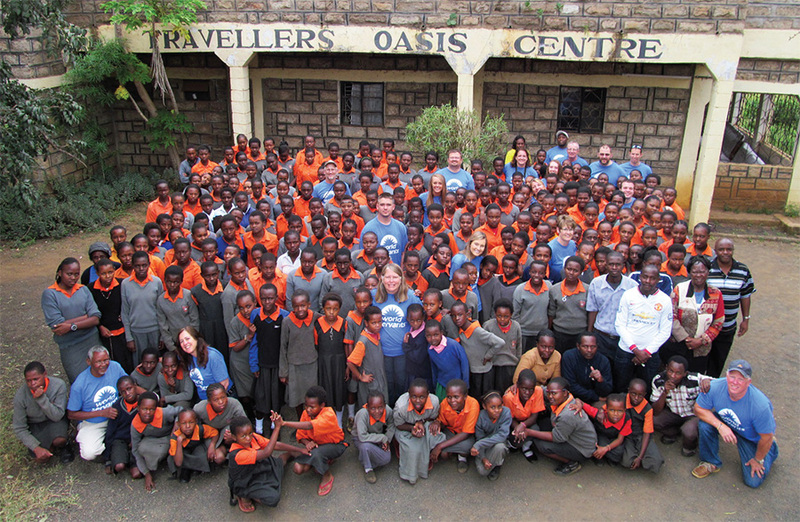 Over 240 girls now call Travellers’ Oasis Centre home and each girl has a unique story to tell. We asked Mission Greenhouse participants to share some of these stories, along with several other memories from the trip, with Vital. Mission Greenhouse participants with the students and staff of Travellers’ Oasis Centre. Jerry Nash helping install a window. 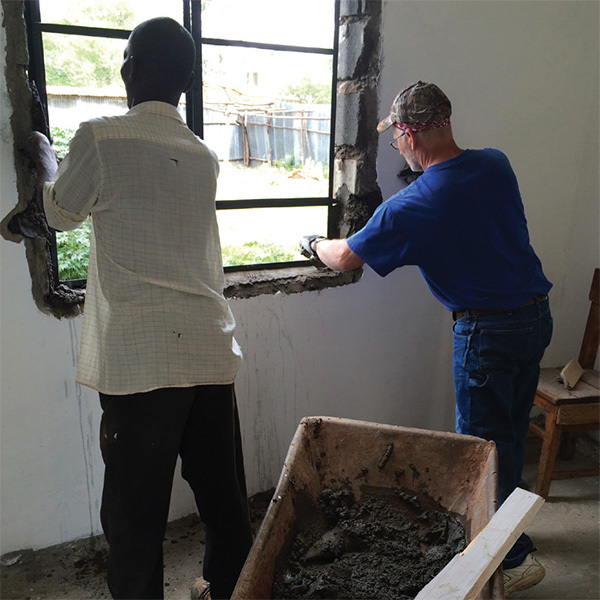 The 2015 Mission Greenhouse team arrived 15 strong in Sultan Hamud, Kenya with a newly constructed three story dormitory for the girls boarding school, Travellers’ Oasis Centre School for Girls, that had two floors of walls and ceilings newly plastered and in need of sanding and painting. The dorm consists of three stories with a continuous hallway with walls that separate bedding areas on each side, where four students per side will reside. 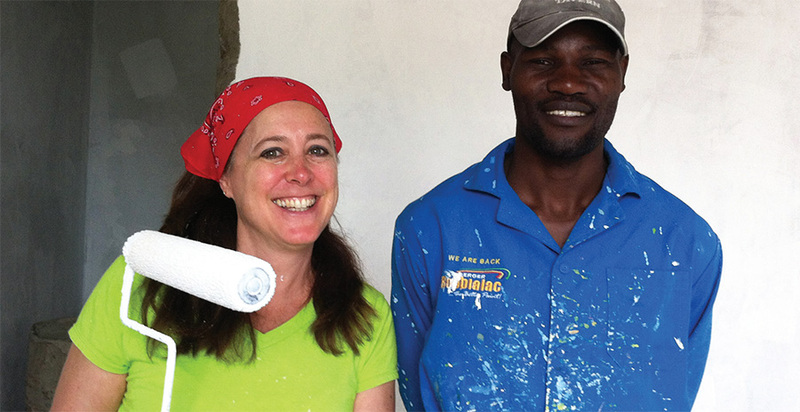 On Day 1 we promptly began sanding all of the walls/ceilings and then following up with an initial coat of primer. This serves the purpose of sealing the walls and also helping to highlight the imperfections (cracks and missing plaster) that we then skimmed over to smooth and cover so these areas would not be visible after final painting using colors that will reflect the school’s orange and grey uniform theme. The process necessitated re-sanding with two additional coats of primer to follow. Completing all of this required the team be relentless in continuing to keep paint on the brush and rollers rolling! The team, young and old, maintained the required focus driven by our collective desire to complete the goal of having the first two floors ready for final paint by the time we left. In the end, we were successful as the final hour of the final day found us all in the 1st floor common area applying the final touches with the remaining primer. In addition, the team assisted in beginning to install the first story windows and even found time to paint the outside pillars and detail to highlight and begin to showcase what will soon be the pride of the school and entire community. A fantastic team effort by everyone truly reflected we were on a mission – a mission that was accomplished! As my family well knows, I am a self-professed hater of posing for pictures. The entire process of posing and applying just the right amount of smile, not to mention the trauma of seeing the end result, are the reasons. I can assure you that the Travellers’ Oasis Centre School for Girls, surrounded by its 241 lady students, is not the environment for someone inflicted with this malady! Nothing pleases the girls more than having their pictures taken, performing for videos, and most horrifying, posing with POET team members. I must confess that I am now a semireformed hater of taking pictures as I quickly found that being surrounded by these young ladies with their natural, gorgeous and ever-present smiles was contagious. It wasn’t long before this exposure had me requesting my POET team members to assist in getting photos of me alongside this beautiful, loving and extremely capable group of young ladies that despite the many hardships and challenges that they face on a daily basis, did not let it deter their enthusiasm and optimism for life and their future. Posing simply became a matter of an arm around their shoulders. As for the smile, being in their presence made it impossible to try and manage, as I could feel that it was as wide and genuine as it could get and I couldn’t have lessened it had I tried! The moment we stepped off the bus after arriving Sunday night at the school, I knew this week would be extraordinary. As we walked towards the chapel, the girls lined both sides of the path singing and holding welcome signs. Bright smiles on their faces will be forever engrained in my memory. The walk itself was surreal—like out of dream. We made our way into the chapel and sat down. The girls were so excited to see us as they made their way inside. Several groups of them sang songs and even danced in celebration of our arrival. Their welcome to us was truly aweinspiring. Something I have never experienced nor will ever forget. As the team arrives, the girls from the school line up to greet them. Ken has been a professional painter for five years. He is 38 years old, married, and has a 10 year old boy and 6 year old twins, a boy and a girl. He lives in Nairobi. He takes pride in his work. He said if you do good work others will see it and more work will come. I believe he wanted us to do a good job because it reflected back on him. He is very soft spoken and a patient teacher! Ken would gently point out spots I had missed or where paint was dripping. He would also point out areas that I did well and tell me, “Perfect!” He has a big beautiful smile! After finishing our first day working on the new dormitory, I felt a light tap on the shoulder and a quiet voice asking to take a photo with me. Some of the girls from the school had come out to talk with us and take some photos. Little did I know I was about to meet someone that would forever change my life. The young girl standing behind me was Purity Mwende Koki, a 13-year-old student in Standard 8 (8th Grade) aspiring to attend university in America to become an engineer. Over the course of many conversations filled with shy waves and grinning smiles, a strong bond was formed. She told stories of nights spent praying to God asking him to provide food for her and her three siblings who were all lying together on a small cot with their sick mother. Purity explained that she would not be attending school and likely living in the streets or worse if it wasn’t for the grace of God and her grandmother contacting Travellers’ Oasis Centre. During our tear-filled goodbye, she slipped me a letter promising to always remember me and blessed me with the following words: “May God give you… for every storm a rainbow, for every tear a smile, for every care a promise, and a blessing in each trial. For every problem, life sends a faithful friend to share, for every sigh a sweet song and an answer for each prayer.” The next sentence in the letter hit me the hardest: “Even if we don’t know each other well, remember there was once a time we didn’t know each other but that time has now ended.” That moment, forever engrained in my mind, is a reminder of the promises we made that day to always remember each other. Having been on the trip last year one of the highlights for me this trip was hearing and seeing the success stories of some of the girls that graduated from Travellers’ Oasis Centre (TOC). One of the teachers at the school this year is a graduate of TOC, went to college and now is back teaching at TOC. During the fourth day at the school, I was at the Admin building and two girls came up to me calling me by name because they remembered me from last year. They had graduated from Form 4 (12th grade) last November and are both attending computer science classes in Nairobi. They came back to the school to visit Mary, the staff and some of the girls. There is also the girl that now owns her own computer store where we got our pictures developed. 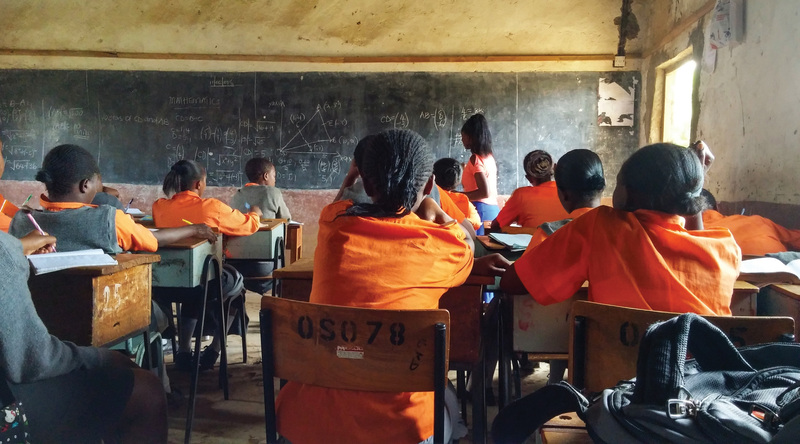 It is so rewarding to see these success stories and is a great tribute to all that Esther and Shadrack started so many years ago to provide for brighter futures for these girls. I have become very close to Terry who is now in Form 4 and the School Captain. We stay in touch via Facebook when she is home on break. She is planning to become a lawyer to specialize in Family Law. I look forward to staying in touch with her during her college years and to see the successful young woman that she grows up to be. While the majority of the time during the trip was spent working on the construction of the new dormitory, we also had the opportunity to experience a little of the daily life of the students as well. That is when I had the chance to sit in on a Form 3 (11th grade) mathematics class. As I walked into the classroom I was quickly approached by a vibrant 15 year old named Charity who offered to have me share her desk. I willingly accepted and joined her at her desk in the corner which was no wider than a foot or two and had books stacked up on the side with her notebook out ready to learn. Within 5 minutes I was blown away by how attentive the class was. The teacher kept the students engaged by constantly asking questions, repeating her points and asking them to complete the problems that she wrote out on the board. There was no down time in class and they utilized every minute they had together. I was even more impressed with Charity. The subject that day was something with shapes and vectors which had me confused from the get go, but not Charity. Charity knew each answer before the teacher had gotten to that step and was working ahead within the book. She would follow along for the beginning of the problem and then take off. Her notes were so neat and organized and she used a ruler to draw any lines or shapes. I asked Charity what her favorite subjects were and she said Math, CRE (Christian Religious Education) and English. If all goes well Charity will move onto Form 4 in the fall and onto University after that. She hopes to study Computer Science or Food Technology. Charity is a prime example of the girls at TOC. 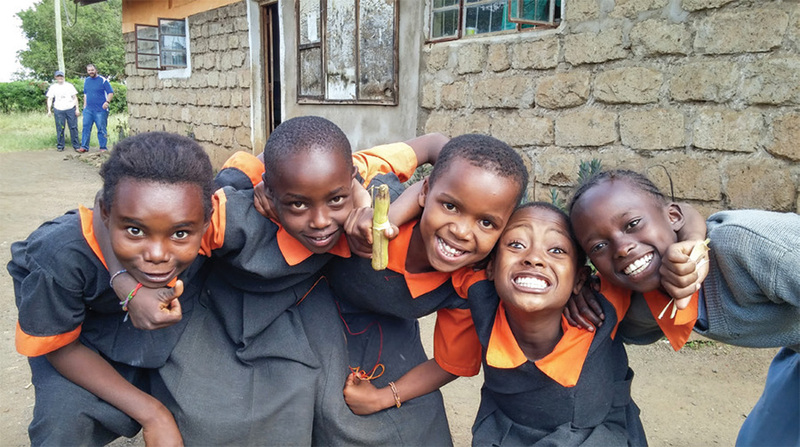 These beautiful, smart and determined girls realize that an education is something to be treasured. 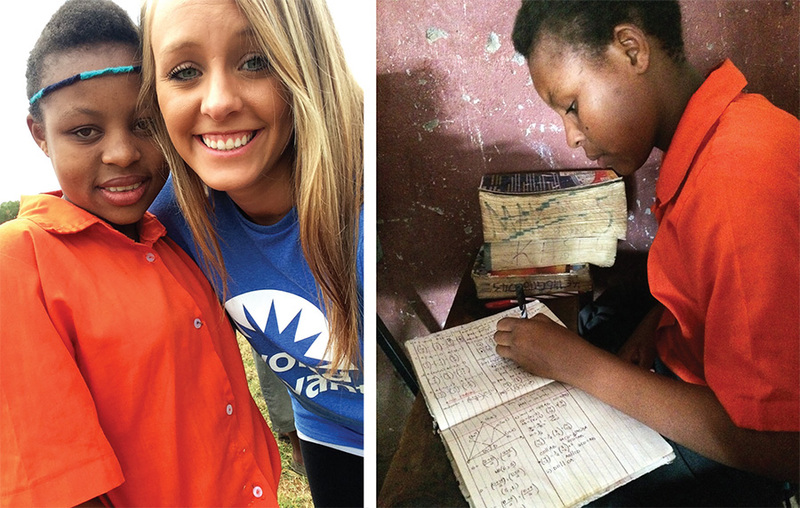 They value their education and are striving each and every day at the school for a better future. While I still was not an expert at vectors by the end of math class, I was definitely inspired. I thought about going on the trip last year but wasn’t able to go because sisters expect you to go to their wedding. Go figure. After talking with a lot of the people who went on the trip last year, I definitely wasn’t going to miss out on the opportunity this year. A fellow Process Engineer in Sioux Falls, Scott Radigan, went on the trip in 2014 and before I left he told me I should find a girl named Faith andnd give her a hug for him. As I arrive at the school, I see 242 girls and I begin to think this may be harder than I thought it would be! So Day 1, I looked for her and no luck. Couldn’t find her. On Day 2, we were getting ready to leave the school and I see her. Faith came over to me and said, “Do you know you look a lot like Scott?” I am guessing the smile on my face was very large at this time. I said yes, I know Scott. She and I talked for a few minutes and she wanted to know all about Scott and his family. 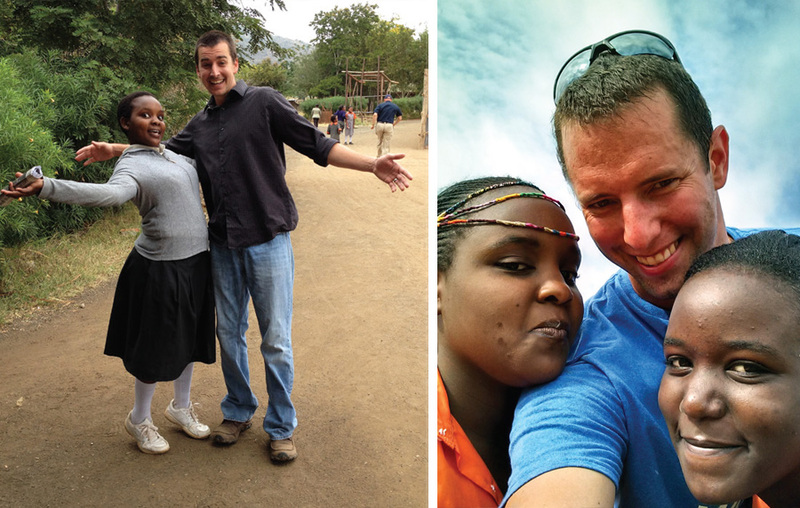 I just think it is awesome that half way around the world, Scott and I have both become friends with Faith. She definitely has a fun personality, if you can’t tell from the photos. Seeing how big the smiles are on the girls even in the midst of challenging life circumstances has resonated with me since I have gotten back and the hard days at work don’t seem as hard anymore. It was one of the best trips I have been on.